Don’t ever stop searching for something that isn’t there. Some people need to learn things the hard way. Apparently, I am one of these people. 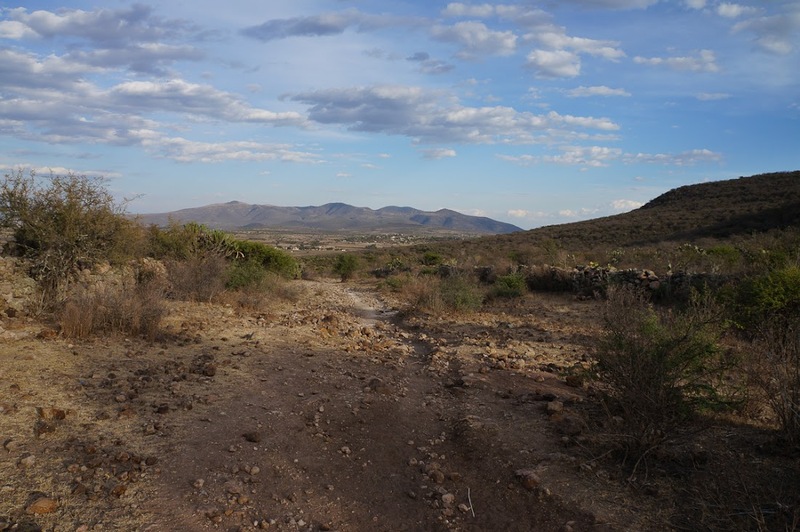 This is the story about how I stubbornly bumbled a few kilometers (with my bike) through the underbrush up a mountain in the dark in order to reach a trail which no longer exists. 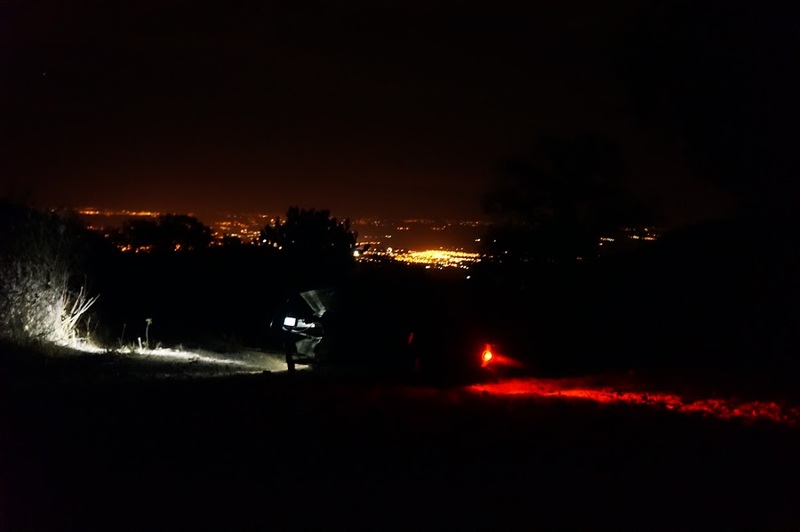 Before I tell the story, I would like to share with you seven top tips that are sure to get you stranded mountain biking in the dark. Don’t ever stop searching for what isn’t there! I will be grateful if you can empathise with me, but I will understand if you just think I am an idiot. I should have turned back when I saw dusk approaching. Unfortunately, I am stubborn and don’t like turning back on a route when I think I can make a loop out of it. 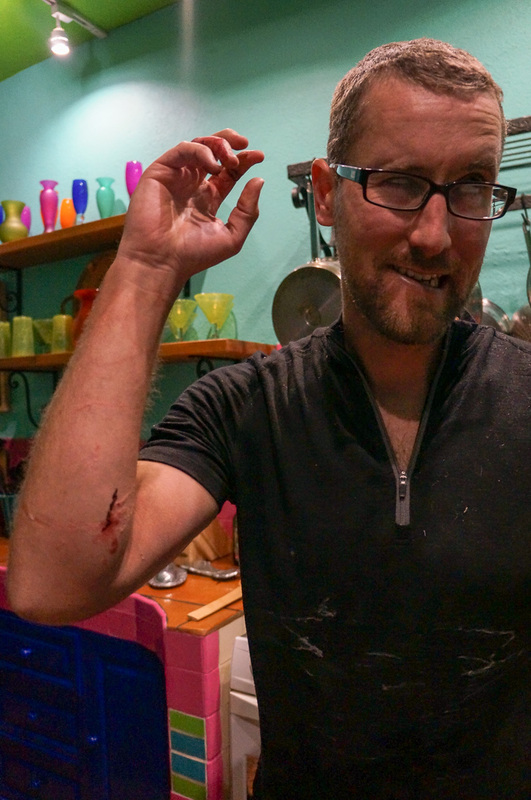 A late afternoon ride of rolling singletrack turned into a cyclo-nightmare when I later found myself clawing through the underbrush in the dark. It started as a leisurely late afternoon ride. I was riding along the easy rolling horse trails on the east side of the mountains whilst the sun was threatening to set in the west. I noticed a tough climb heading up towards a connector trail I’d spotted earlier on Google satellite view. 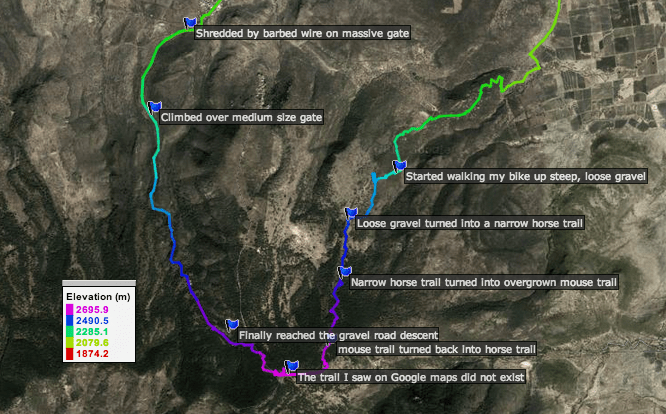 I could see the trail on my Garmin Edge 800, so I felt pretty confident it would work out. I bit my lip and burned up 1000ft of switchbacks towards my holy grail connector trail. Standing at the crossroads just before sunset, do I turn left and safely descend home or turn right and climb unknown terrain up to the 2650m (8800ft) summit? The road steepened, turning into loose gravel before narrowing into a horse trail. Little did I know that the trail I was searching for had become overgrown with thick underbrush. After heaving my bike up 300m of disused trail, I realised that I still had another kilometer to reach the gravel road near the summit. The waypoints on the map clearly show a strong correlation between steepness of terrain and my level of depravity (map generated at GPSVisualizer.com). It was pitch black. I had minimal water and no food. Fortunately, I had my hub dynamo lights, but they are not very bright when moving at such a slow pace (I was averaging 1.5km/hr through the brush). I thought about going back down the mountain. Considering my bonkers predicament, this would have been the wiser decision. Instead, I stubbornly continued, breathless and stumbling like a cyclist zombie. 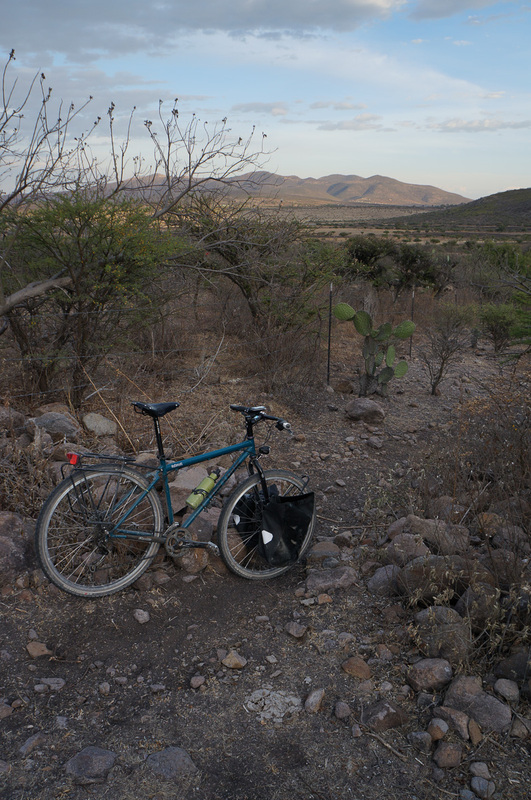 Here’s the view from the gravel road at the top after a few hours of clawing my way through the underbrush. I reached the gravel road at 10:30pm. Surely I had surmounted the final hurdle. All I had left was a 4km gravel road descent, followed by 10km of mixed cobblestones and paved road. I whizzed down the gravel road only to be confronted by an enormous black metal gate covered in barbed wire. I was unwittingly trespassing in the middle of the night. I knew there would be dogs nearby, so I tried to be quiet. It was no use. The first dog heard me break a twig and that set off a chorus of neighbourhood mutts loyally alerting their masters of the dangerous midnight ciclisto mucking around in the village fortress. I propped my bike against the fence, clambered over, then reached down to heave it from the other side. As I scrambled to escape, the dog posse became louder and louder and I was sure someone would come out and shoot me. Full of adrenaline, I clumsily yanked the bike over, dragging both my arms and my bike across the rusty barbed wire. I acquired some nice scrapes and bruises before my not-so-smooth getaway from the little township of Alcocer. I finally arrived home just before midnight with my tail between my legs. This was fitting because I was immediately sentenced to the doghouse on account of all the worrying I caused Jenny and my Mom. Apparently they were ready to go to the local policía to report me as missing. I’ve since recuperated and apologies have been accepted, but the question still remains… will I ever know when to stop searching for something that isn’t there? In my hurried attempt to escape undetected by the guard dogs , I acquired some lacerations climbing over the enormous black metal gate covered in barbed wire. Photo taken just before midnight back at la casa. 8 Responses to "7 Tips to Get You Stranded Mountain Biking"
Thanks for writing about the experience – you must have felt horribly unprepared. Can’t imagine what it’d be like to be out there. Damn! Luckily you got home save! Lesson learned 😉 I will definitely remember your (un)safety tips. Try Bing maps sometime. The aerial photos of High Wycombe on Bing Maps are newer than Google Maps. Maybe the same will apply where you are! Gee, why am I surprised? If there’s one thing I know about Hennings, it’s that, if there’s an easy way to do something, you guys will not be satisfied until you find a much harder method. Let me guess, next you’re going to bike over the Darien Gap? I found this hilarious and disturbing in equal measure, Lars. Please come back alive. Your new slogan is superb, though – surely it deserves a place on the website banner?! I hope all is going well and am much enjoying the updates. Today, something the news described as “the sun” appeared in the sky over London….no one knew what to make of it. Glad you enjoyed it! I enjoyed documented it for you! I like your suggestion about adding the slogan to the header banner. I think I will do just that! Andy, I must say I am feeling skeptical about your claim regarding “the sun” appearing in London. I am currently baking in its rays at 25º C, so that clearly isn’t possible! Anyway, I’ll let you believe that if it helps you plow through the snow! All the best and I hope you, Will and Merf can come visit us somewhere on our journey. Just pick a place and we’ll cycle there (NB: please give us plenty of advance notice; Jenny is slow! ).